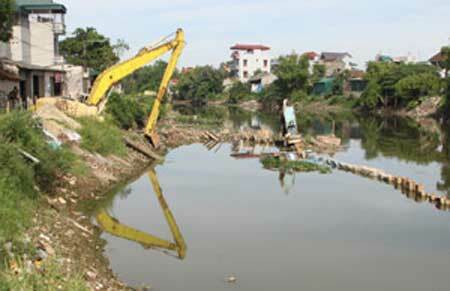 A part of the Nhue River is dredged in Ta Thanh Oai Commune in Ha Nois Thanh Tri District. Residents are benefiting from a $281-million national programme aimed at mitigating pollution. The programme, worth VND5.8 trillion (US$281 million), was approved by Prime Minister Nguyen Tan Dung last September. The fund for this programme comes from the State budget, local budget, official development assistance and other sources. The State budget accounts for 43 per cent and ODA accounts for 27 per cent of the total fund. It aims to focus on three projects of mitigating pollution and improving the environment in 47 seriously polluted craft villages restoring the environment at 100 sites which were seriously contaminated by pesticides as well as collecting and treating wastewater discharged into the Cau, Dong Nai and Nhue-Day river basins. Ho Kien Trung, head of the Natural Resources and Environment Ministrys Environment Improvement Office, said that the Central Steering Committee for implementing the programme has not been established at central level. In addition, a circular to provide guidance for managing and using the State budget to implement the programme had not been issued, Trung said. Under the Ministry of Natural Resources and Environments schedule, the committee will be set up during the first quarter of this year. And the circular is set to be issued during the second quarter of this year. Meanwhile, localities were slowly operating the projects and had not set up plans to implement the programme at every stage of the 2012-15 period, he added. Nguyen Hung Manh, director of central Ha Tinh Provinces Natural Resources and Environment, said Ha Tinh was on course to remove 31 pesticide stockpiles. Many types of pesticides had been used for crop protection against rats and bugs, therefore large quantities of pesticides remained in the province, he said. Among them, there are some heavily contaminated areas that need prioritising to be treated, including Khanh Loc Primary School in Can Loc District and Hung Thinh Street in Ky Anh District, according to Manh. "Weve made efforts to implement the project to remove 31 pesticide stockpiles as planned, but were facing some difficulties. "We are confused by ing a suitable type of technology to treat pesticides because so many types of pesticides need to be treated," he added. The majority of pesticide stockpiles are scattered everywhere, some in schools, others in residential areas, so, collecting, transporting and treating are also one of the difficulties, he said. Manh also called for local residents living around areas where pesticide stockpiles are located to be provided with clean water for their daily lives. Bui Cach Tuyen, deputy minister of Natural Resources and Environment, said solutions to remove difficulties in implementing the programme would be given after discussions at the workshop. Viet Nam also wanted to encourage more international financial support for the programmes implementation 2012-15 and follow-up periods, he added.